We are so excited to share the fantastic wedding of Rachael and Mike with you today. 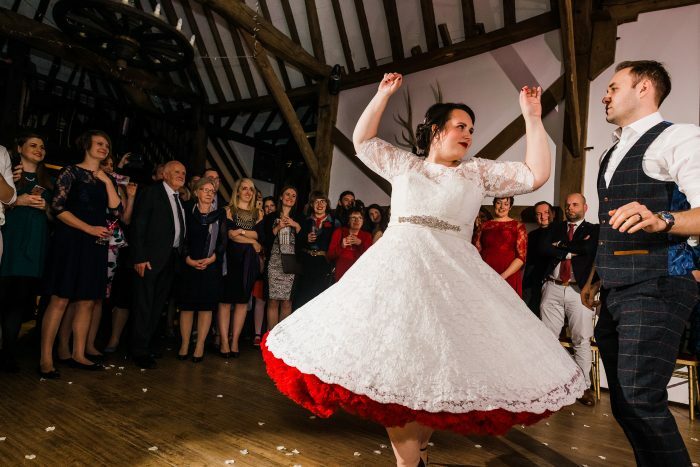 From the pretty additions to her vintage tea length wedding dress to their fantastic dance routines. The couple had their wedding and reception at Blackstock Country Estate. 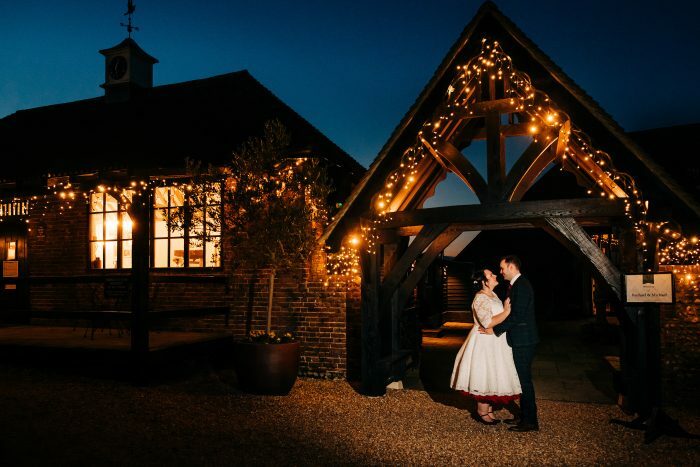 This stunning venue is nestled within the rolling South Downs of Sussex. Their photographer Jenny Rutterford took some amazing shots that the couple have let us use. 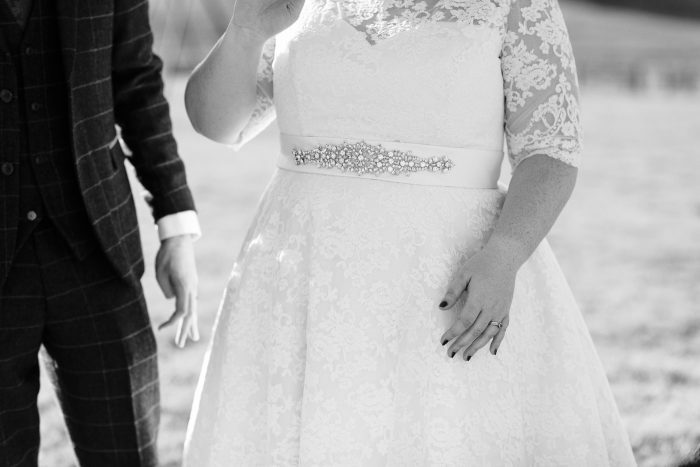 Rachael chose Mae by Timeless Chic which is our in-house designer collection. This gorgeous vintage tea length wedding dress is covered in lace with three quarter length sleeves. The couple are keen salsa dancers and choreographed their first dance routine. Rachael knew that this would be a fantastic opportunity to wear a short wedding dress. Allowing her to really show off their moves on the dance floor. As you can see this is such a great dress to spin in and move freely. A short wedding dress lets you express yourself easily and the 1950’s style skirt creates an eye catching spin. 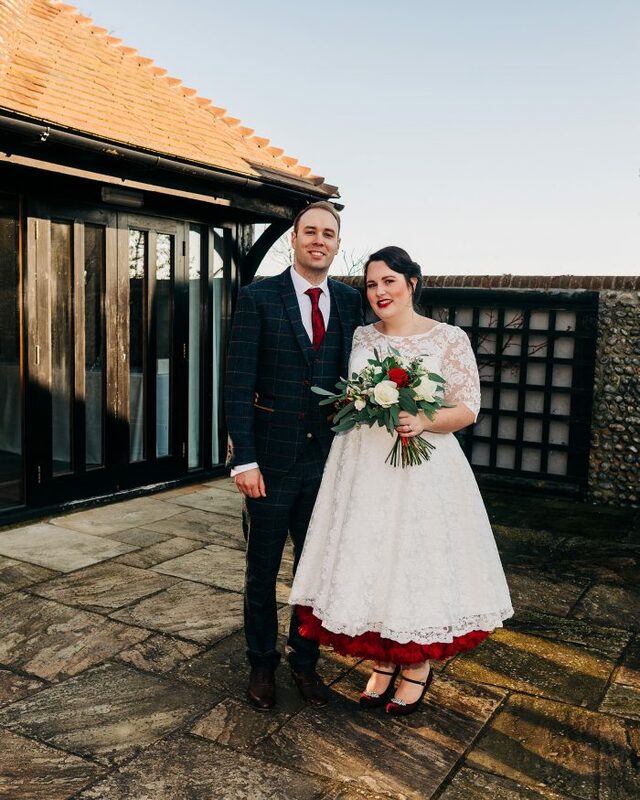 Rachael added some stunning red petticoats under her dress which gave it more volume. 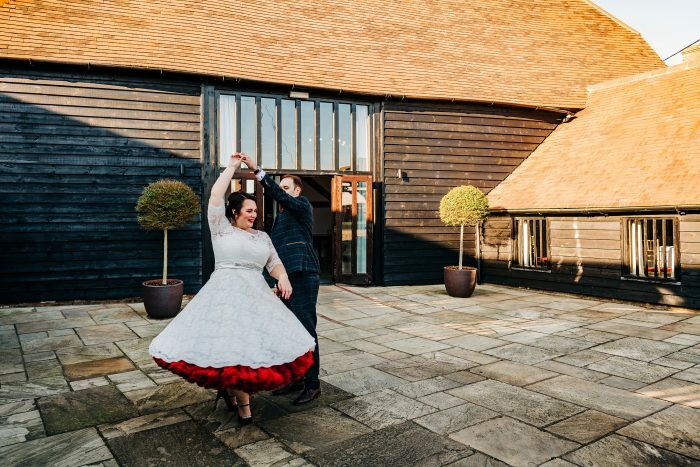 1950s style wedding dresses are fantastic for dancing in anyway and the added volume in the full skirt is amazing. It also gives short wedding dresses an amazing retro feel too and harps back to the glamorous 1950’s styles. Her bridesmaids short red dresses matched the petticoats. Rachael also wore stunning red velvet Mary Jane shoes that had some sparkle to bring the whole look together. The great thing about wearing a vintage tea length wedding dress is you can customise it. This makes it a truly bespoke short gown and Rachael chose a jewelled belt. This sets the dress off perfectly and can be incorporated into other areas such as shoes or jewellery to complete the look. This was Rachael’s first experience of trying on wedding dresses and she felt relaxed. Our dedicated consultants made sure that she felt comfortable throughout so she could focus on wedding gowns. 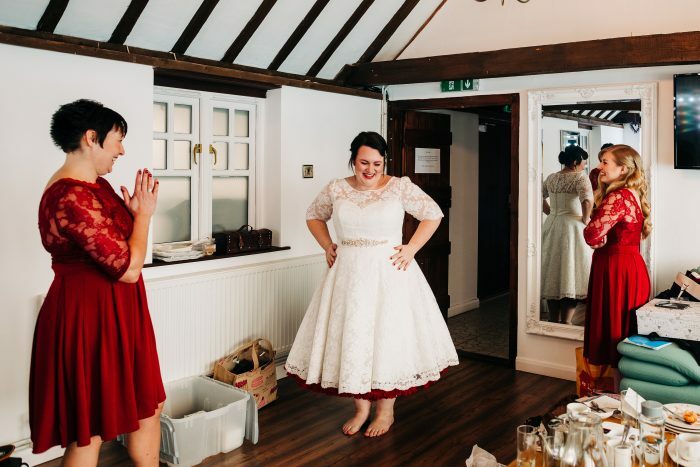 After visiting us she tried on some longer dresses in another boutique to decide which she preferred and it made her realise that a shorter wedding dress was perfect. We are so pleased to share these gorgeous photographs and details of Rachael and Mikes day. Wishing them all the happiness in their futures. We would love to welcome you into our Bexley wedding boutique. With over 150 wedding dress designs we can find your perfect vintage tea length wedding dress. Book your one to one appointment today and we will discuss all the elements of your short wedding dress requirements.